Scene from "Phantom of the Opera"
If you are one of my readers who is trying to follow my life in any consecutive way, I just want you to know that you are about two months behind with my life. I wanted to write to you about Paris, and this post is about Paris, but I will write about the trip I took last week and not the one I took there two months ago. I had big plans to write about that trip. I traveled to Paris in May with two dear friends of mine who didn't know each other before then, and we had a trip worthy of a novel, or a memoir. Who knows - maybe that piece will appear one day, too. So much of life seems to get expressed, and worked on, out of order. And so here I am, two months later, another Paris trip behind me. This time I went with my niece Sarah, who is visiting from America. She's still here, and we're really busy a lot of the time, but I think I have time to capture my thoughts about her and her visit now and then. Sarah had never been outside of the United States until this point, and she was really excited to come. One of the things I love about Sarah is her complete naturalness, openness and honesty. She is as beautiful and fresh as a spring day, and she is in the spring of her life. But she's also like a spring thunderstorm. I went to a Rapha (see link) personal development workshop in England recently and learned that, at least from the perspective of the trainer, each generation has more personal baggage than the previous generation. Our modern life is so difficult, so viciously competitve and merciless, and the values so blurred, each generation finds coping with life more difficult than the previous one, and has more to overcome. Sarah would be the first to admit that she has a lot to overcome. She sees her past as dark. She is a lively person with a volatile personality. She has already experienced trauma in her life. She is drawn, I think, to dark things at least as much as to lightness. But then, so was I when I was nineteen. I remember that my favorite piece of literature was Notes from Underground, a dark piece about an outsider, written by Dostoyevsky. After reading this, I made a conscious decision to be the outsider I already found myself to be. Sarah's hero is Erik, the anti-hero in "Phantom of the Opera". He is an outsider, choosing to live in the cavern underneath the Paris Opera. Erik is in love with Christine, whom he has trained to be the beautiful singer she is. He remains invisible, and is thought to be the ghost who haunts the theater. But he appears before Christine and is very much alive. Sarah, I think, sees herself as a sort of Christine, drawn to the beauty of Erik's darkness and suffering. Christine is also in love with Raoul, a wealthy, handsome, successful Viscount, a symbol of light and unpoiled innocence. Who but an unspoiled, innocent person who had never seen the dark side of life would not be more attracted to the mysterious Erik? It makes perfect sense. And yet, my heart cringes at the thought of choosing life partners who would lead us down to live in the caverns of life. Box five is second from the right. The box on the right is the imperial box. 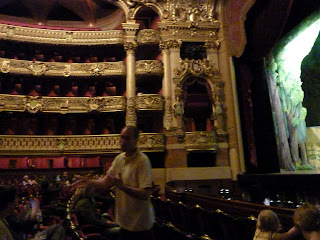 One of the first things we visited in Paris was the Garnier Opera House, the one where the phantom supposedly lived. 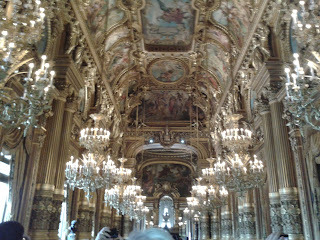 It is truly a spectacular place, full of more gold, glitter, marble and velvet than any other place I have ever been to. We saw the imperial box, where Napoleon III watched performances with his wife and companions - and also box five, the box seat Erik sat in. 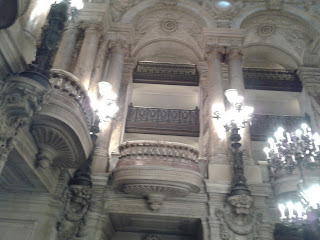 The main foyer, where the opera-goers drink champagne between acts is more sumptuous to me than the hall of mirrors at the Versailles Palace that Louis XIV had built. The inside of the theater is unbelievably light, due to all the mirrors, gold-plated sculpture, and candleabras all over the place. It evoked longings in both of us to be princesses for at least an evening, showing up for the ballet in a horse-drawn carriage, escorted into the ball by a handsome young man dressed in a long dress coat, while we wear beautiful gowns showing off our perfect bodies, glittering from diamond tiaras. Actually, I think Sarah would rather be one of the singers in the operas that are also performed there. The costumes are also pretty magnificent. It's interesting to me that much of the story in this opera takes place, not in the spectacular theater, but in the dark, mysterious, murky underground cavern and lake underneath the opera house. I learned that the lake really does exist. It was the lake that inspired Gaston Leroux to write this piece that Andrew Lloyd Weber turned into a musical. 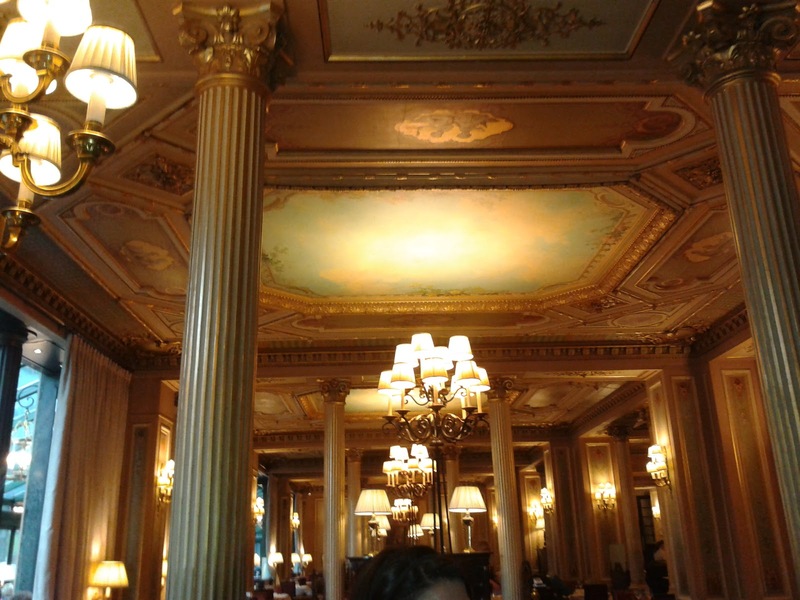 After visiting the opera house, we went into Café de la Paix, which was designed by Charles Garnier, who also designed the opera house. It is similarly grandiose. I don't know why we weren't too intimidated to enter. Possibly because we both know that we descend from King Edward III. We let that sink into our psyches. Anyway, neither of us had ever been in such an ornate, perfect café. There was no table ready for us, so we had to sit at the bar for a while. I was already in the reckless spirit Gil must feel in the Woody Allen film "Midnight in Paris", when he finds himself transported into 1920s Paris, conversing with famous literary figures from the past. We were there with the characters from the "Phantom". Sarah had already been asking about drinking an absinthe. 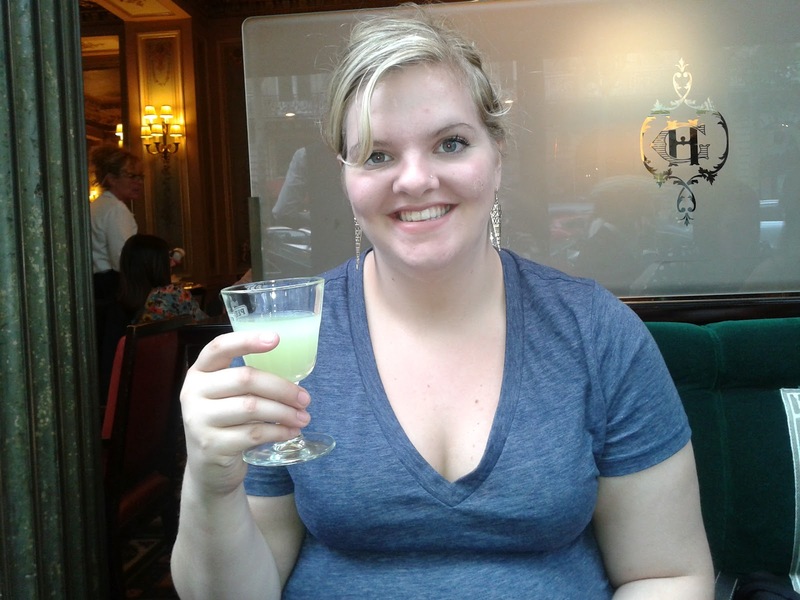 She is under age to drink in the United States, but it's perfectly legit here in Europe for a nineteen-year-old to be drinking absinthe. The fascination was surely the supposedly addictive qualities and the fact that this drink was banned for so long. When we started sipping our drinks, sitting in possibly the most high-class café in Paris, certainly one that served absinthe to people llike Christine in "Phantom", the thing we most noted was that it tasted quite normal, a lot like Pernod, and that we would be have to be lying or hallucinating to say that we had seen any green fairy. But the café did not disappoint us. Sarah liked her crème brulée so much, she ordered another one that same day in the evening. Now she is known as the one in her family who ate two crème brulées on the same day. One of them cost $15, but was the best I had ever tasted. That evening we watched "Phantom of the Opera" in our tiny but chic hotel room, on my laptop. I downloaded it before we left for Paris. It must have been at least the twentieth time Sarah had watched it, but only my second. Since returning to Cologne, I've been helping Sarah with her music. I've taught her to read music so that she can play the notes on the piano and sing them. This should help her to sing the notes more accurately. I've been helping her with breath support and projection. I, who have sung solos only a few times in my life. I, who also had the dream of being a musical performer. I am, but only in a gospel choir. I don't dream about singing solo anymore. I am content to help Sarah achieve her dreams. The music she is practicing so diligently is really complicated, with incredibly difficult intervals. She brought the music with her - Christine's songs from "Phantom of the Opera". My dream for Sarah - and still for myself - is that she - and I, who also am not finished with my life, can use the darkness in our souls to explore and understand the depths. That is so that she and I can climb out ouf them. I hope that she will continue to join forces with God, working with God's help, finding herself, as I do for myself, less an less a captive of the darkness. I hope that she can accept the darkness when it comes, but that she will dwell in the light, one day helping others to find a way through their own darkness, as she lives in the light that's there for all of us. I hope to see us both laughing, joyful because we are overcomers.